We also supply and install solar grid-tie systems with or without battery backup. This is where the power generated by the solar (generally) on the roof is transformed into useable household power. The home uses what it needs and then either puts the excess into the batteries for later use or exports to the grid. Solar Options uses the best grade A, tier 1 mono crystalline Photovoltaic panels available. Solar photovoltaic panels generate Direct Current (DC) electricity when exposed to light, but for most applications, the electricity needs to be converted to Alternating Current (AC). It can then be used to power AC appliances or interface with the electricity grid. This requires an inverter. 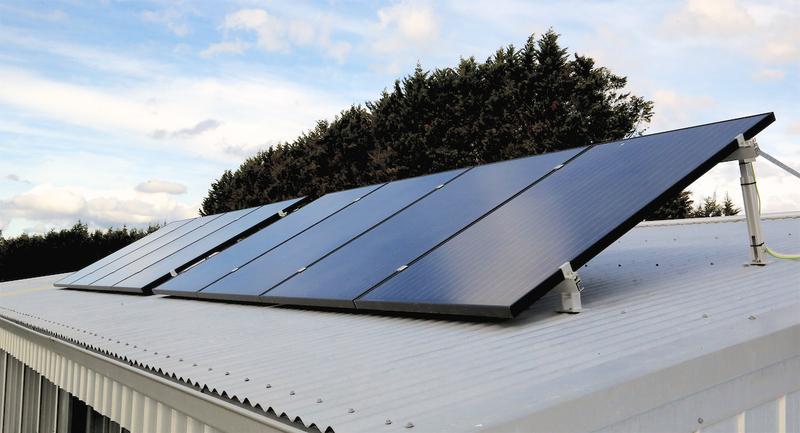 To operate at optimum efficiency, the panels have to be connected in certain configurations to match the input voltage requirements of the inverter. The panels need to be attached to the roof of the building or ground mounted with purpose built railing equipment. Grid connect system ties in with your exisiting home electricity supply, ensuring you have all the electricity you need 24/7, regardless of weather conditions or the time of day or night. The age of Solar Storage or Solar Battery Systems, is finally upon us. While our off-grid rural customers have long been aware of the challenges and expense of storage batteries, there have now been developments that make batteries more viable for grid-connected consumers. The new generation of lead carbon and lithium batteries are changing the formulas dramatically. They provide more usable power, more recharges and last much longer than conventional lead-acid batteries. Like most new technology, batteries are steadily becoming less expensive. The inverter charges the Direct Current power from the batteries to the Alternative Current power, which can then be used to run household appliances. The size of the inverter depends on the power usage of the customer. Inverters also protect the battery bank by shutting down if batteries do not have enough charge. If a back up generator is used the inverter can be set to automatically start the generator to boost the charge in the batteries. One of the most useful tools to manage energy use is a monitoring system. This can vary from a small device to measure the power drawn by one appliance, to a Wi-Fi monitor that measures your total energy draw in real time. Some inverters now allow for the system to be monitored remotely, either by the manufacturer or by the consumer via a mobile app. 250 – 310 watt solar panels. A Grade modules- 25 year warranty. AC and DC isolator switches. Enphase and Rene solar Micro inverters.